ITEMS CAN BE MADE TO ORDER! Welcome to the Reflections company website. 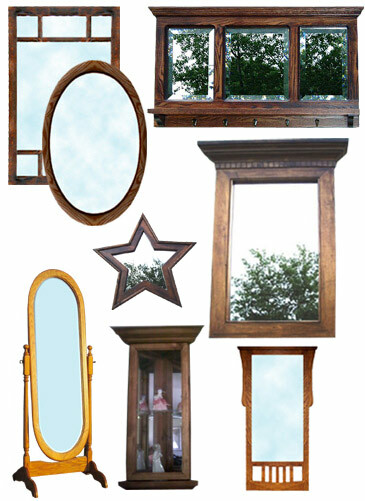 Reflections manufactures and distributes solid wood decorative mirrors including custom mirrors, we also manufacture solid wood urns, pet keepsake memorials, custom display cases, cabinets and shelves. Our wood products are 100% Canadian made quality pieces that will last through the ages. Reflections prides itself on our handcrafted products using the finest wood available, including pine, oak, maple and cherry. Cheval Mirrors, Oval Cheval, Raised Head Cheval, Raised Head w Mullions, Round Head w Mullions, Cathedral mirrors, Oval mirrors, rustic square mirrors in 4, 6 and 8 panel styles, and our newest edition the 5 point star mirror. Reflections specializes in building and finishing custom framed mirrors for larger projects such as hospitals, hotels, condominium developments and high end homes, Contact Glen @ Reflections for more information on our wholesale pricing. View our mirror catalog in PDF format - click here. For our custom wood projects you can specify the type of wood used. Copyright © Reflections Elmira 2017. All rights reserved.